My nam e is Gary. 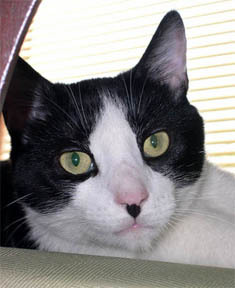 I’m a black and white domestic shorthair cat. I was born in Virginia Beach Virginia in 2002. The first 2 years of my life were difficult but I was adopted in 2004 and that’s when my life changed for the better. I currently reside in the Shenandoah Valley of Virginia with my two people and a diminutive tuxedo cat named Mitzki. I also have an outdoor “kitty-brother” named Jason who came with the house. I understand several languages but am only fluent in two. I like napping, playing, and getting brushed. I love my family and they love me. Hi gary! you’re very handsome..My girl Audrey is watching the screen right now..I think she might be interested! hehe.